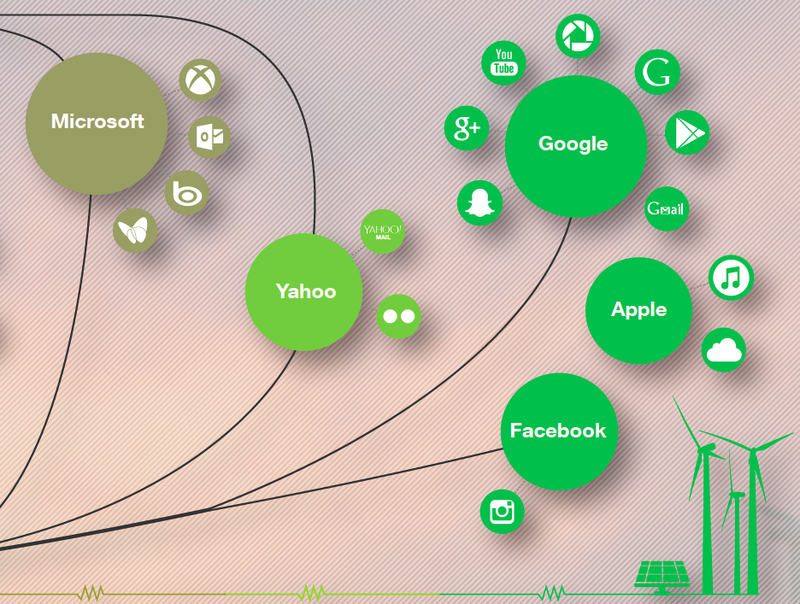 Here’s the good news about Greenpeace’s new report on the Internet and clean energy: a handful of web giants, like Google (s GOOG), Apple (s AAPL), and Facebook, have made impressive strides in recent years to find clean energy sources to run their web services. Here’s the bad news: Amazon Web Services (s amzn), the hands down leader in public cloud computing, remains one of the dirtiest and least transparent internet infrastructure companies around. 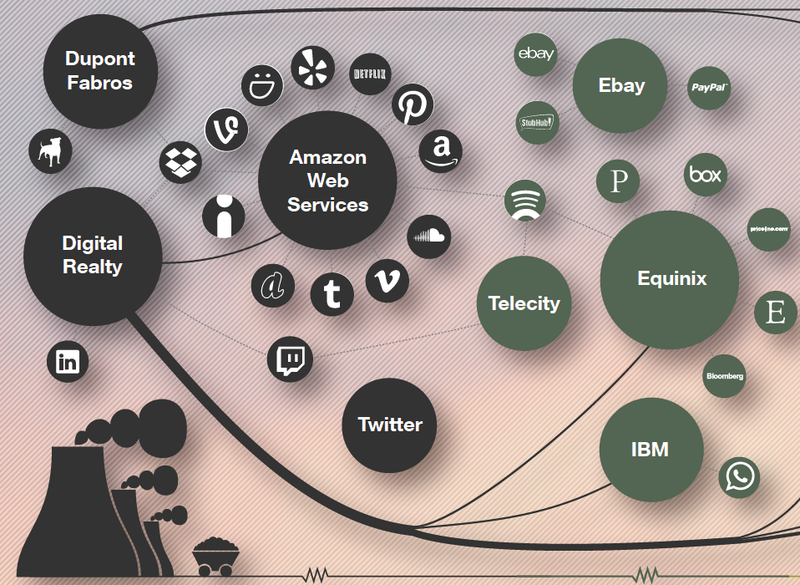 For the report, Greenpeace looked at 19 of the largest information technology companies — from web giants to co-location providers — covering about 300 data centers. Greenpeace’s last clean cloud report was released about two years ago, and over that time many of the companies have made significant improvements. Six high-profile Internet companies — Apple, Box, Facebook, Google, Rackspace(s rax), and Salesforce.com(s crm) — are now committed to powering their data centers with 100 percent clean power. This is actually a huge achievement, considering clean power can be more expensive and harder to access in many areas. These moves have already had some very large real world impact. For example, following pressure from Apple, Google and Facebook, North Carolina’s local utility, Duke Energy, created a new program to provide clean power for their data centers in the area. The long-term impact of running the Internet off of clean power, is that as Internet access and Internet infrastructure invariably grows, the carbon emissions associated with the Internet will drop or remain steady. Already power associated with running data centers accounts for 2 percent of energy consumption in the U.S. (most of that is from fossil fuel-based energy). Despite these green moves, Greenpeace calls out Amazon as being particularly resistant to committing to clean power, and to being transparent about its energy assets. Greenpeace says AWS is “far behind its major competitors,” when it comes to clean power. Twitter(s twtr) also lags, says Greenpeace, though AWS is particularly worrisome because so many companies run services off of AWS. Greenpeace’s report misses the mark by using false assumptions on AWS operations and inaccurate data on AWS energy consumption. We provided this feedback to Greenpeace prior to publishing their report. . . AWS operates efficient and highly utilized datacenters across 10 different Regions globally, two of which (Oregon and GovCloud Regions) use 100% carbon-free power. When it comes to energy, Amazon seems far more concerned with energy efficiency, which reduces its energy costs, than it is with the source of its energy. Amazon has said that it’s been building its own electric substations and even has firmware engineers rewrite the archaic code that normally runs on the switchgear designed to control the flow of power to electricity infrastructure. Google has arguably done more than any company when it comes to all the various ways to back clean energy. The company has spent over a billion dollars on clean energy projects, and has numerous power purchase agreement contracts to buy clean power from utilities. Apple has been the most aggressive in terms of building its own clean power assets — it built massive solar farms in North Carolina and is doing the same in Reno, Nevada. Updated at 12:45pm on Wednesday April 2, with comment from Amazon. I wonder who the first environmental organization prosecuted under the RICO Act will be? Looking more like harassment and environmental extortion, in my opinion. So what’s the angle here? Buy from our buddies in Silicon Valley or we’ll defame you and your customers? If you want a cloud that works then you cant run it on hamster wheels! It’s s shame Amazon are so quiet about this officially, as it can be quite a good differentiator which is hard to replicate except by the larger guys (like Google). Losers are losers. Never succeed.